Aloha: My name is Elisa. 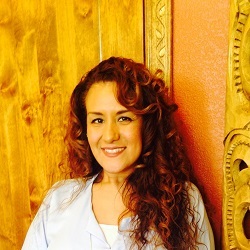 I am very happy to be part of the Hawaiian Experience Spa family. It is very exciting to me to be able to learn and adopt the ways of the spa, so I can provide excellent service to my clients. I attended Southwest Institute of Natural Aesthetics program where I fell in love with everything that has to do with skincare. Through the years as an aesthetician, I have been able to help clients with different skin concerns, addressing anything from fine lines to acne on the face and also provide body wraps and scrubs. I am from California and have lived in Arizona for many years. When I am not working, some of the things I enjoy doing most are variations of art, working out, getting together with friends and spending time reading a good book.